Over the last year I've heard a lot about vegetarian tacos at Chaia. They started selling their creations at farmers markets, but I rarely wake up early enough to visit the markets on the weekend. Or even if I do wake up early enough, I'm too lazy to get dressed and wash off the makeup after a night of dancing to metro over to a farmers market. 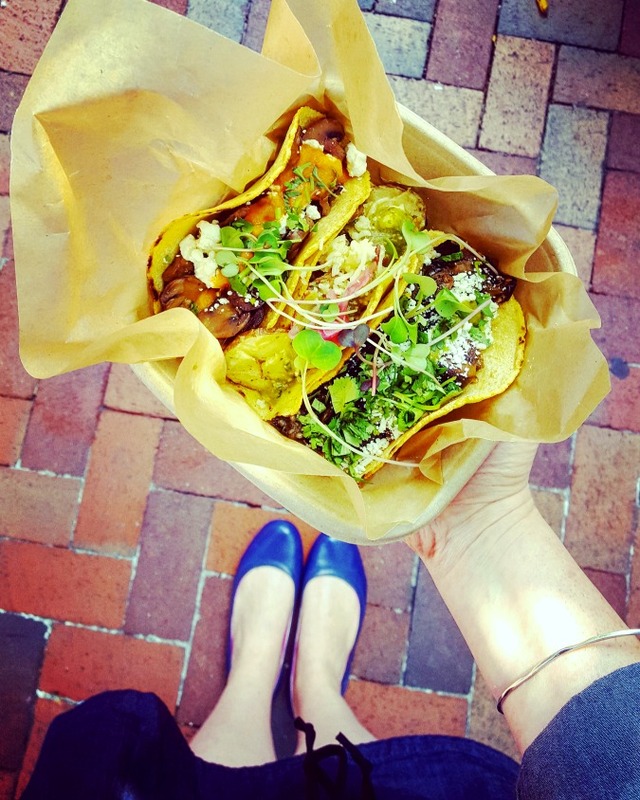 But then Chaia opened a location in Georgetown! This, I could do. I waited, however, for the weather to cool down a bit and for Uber to have one of their specials where I would pay only $3 to pool from my condo to Georgetown (instead of taking the metro, which is especially a mess on the weekends, and then walking). Anywayssssssssssssssssssss. I finally made it to Chaia a few weekends ago to meet with my friends Alyssa and Nazilla. The restaurant is adorable. Great music. Welcoming decor. I liked that there were only 5 tacos to choose from because sometimes I get overwhelmed by the choices. From the menu below I chose the mushroom taco, creamy kale & potato taco, and an eggplant taco. I liked them all. They were filling, delicious, and creative. I also liked the hot sauce available at each table. You get 3 tacos for $11, which is a pretty good deal. So if you are looking for a Meatless Monday dinner, check them out for sure! Or you can use the ingredient combination as an inspiration for your next meal.